Microsoft CMO confirmed the birth of Microsoft Surface smartphone. If rumours come true, new Surface smartphone with Winnows 10 OS, Surface Pen and Pressure sensitive key board will launch by Q2 2016 get sure it will cost you approx. Rs 50,000. It will give stiff competition to Apple, Samsung and HTC in high-end smartphone market. According to leaks, Microsoft Surface smartphone will support Dual-SIM(LTE+LTE) with 4GLTE, Wi-fi, Bluetooth, GPS and USB offers you a bigger 5.7”-inch Quad HD (2560 x 1440 pixel) display with Clearbalck Gorilla Glass 4 will run on latest Window 10 OS. Microsoft Surface smartphone will be powered by a 64 bit Intel Atom x3 (SoFIA) Processor with 4GB RAM, 64GB/128GB in-built memory variant with MicroSD card slot will sport a Huge 21-MP rear PureView camera with Zeiss 6-lens for shooting and 8-MP Zeiss wide-angle lens for clicking selifes and making video call will be powered by a powerful 3000mAh battery including Surface Pen and Pressure sensitive key board. However no official confirmation from Microsoft so far. 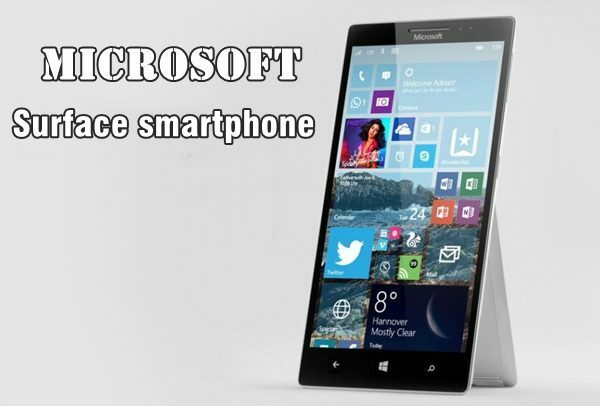 At last Few honest word from heart that upcoming Microsoft Surface smartphone coming to revolutionize the smartphone market. What you think? Please stay tuned for more updates.